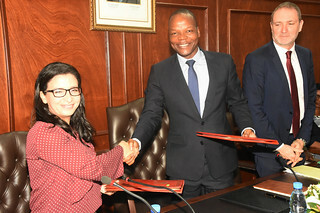 06/03/2019 - On 5 March, Morocco and Cameroon launched a new Tax Inspectors Without Borders (TIWB) South-South bilateral programme in Yaoundé, Cameroon. The programme, a first between two Francophone African countries, will see Moroccan tax audit experts providing support to Cameroon. Both countries are members of the Cercle de réflexion et d'échange des administrations fiscales (CREDAF). The programme will focus on the audit of multinational enterprises. This TIWB programme is the second programme requested by Cameroon following the completion in January 2019 of a highly successful bilateral programme with France, which has been running since October 2017. Mr. Modeste Mopa (Director General for taxes of Cameroon), Ms. Samia Abdelghani (OECD Tax Advisor), Ms. Wiam El Kacimi (TIWB expert from Morocco) and Mr. Jean-Marc Niel (Secretary-General of CREDAF), participated in the official launch of the TIWB bilateral programme. Mr. Mopa thanked the TIWB Secretariat and the Kingdom of Morocco for providing an expert for this new TIWB programme and highlighted the benefits Cameroon will gain from the programme in terms of additional tax revenue and tax audit capacity building. The aim of TIWB, a joint venture between the OECD and UNDP, is to provide requesting countries with technical and practical tax audit assistance in order to enhance capacity in recipient tax administrations and better tackle international tax evasion. This assistance, which offers a variety of techniques and methodologies, consists in providing practical hands on support on audit of live cases. The TIWB initiative stemmed from recognition that external expertise could strengthen the efficiency of the actions undertaken by tax authorities of developing countries, and help mobilise domestic resources. TIWB is keen on improving synergy with the efforts of CREDAF, created in 1982 in Yaoundé as a non-profit, non-governmental French-speaking association, which brings together senior tax administration officials from 30 French-speaking countries on 4 continents. Its purpose is to facilitate dialogue and exchange between member countries and to promote multilateral international co-operation based on common interest and pooling of experiences.